Home To Venture once more.. While chatting to a customer he mentioned that earlier in the day he had joined his father on a drive to Kilcoo to gather some blue potatoes. On their return trip they stopped at Meelmore Lodge cafe to avail of a cooked lunch and a warm brew. Meelmore lodge is along the Trassey road, just outside the sleepy hamlet of Bryansford with amazing views towards the Mourne Mountains. The son recalled his father looking towards the mountains and saying, “If only I could once more venture into the hills”. 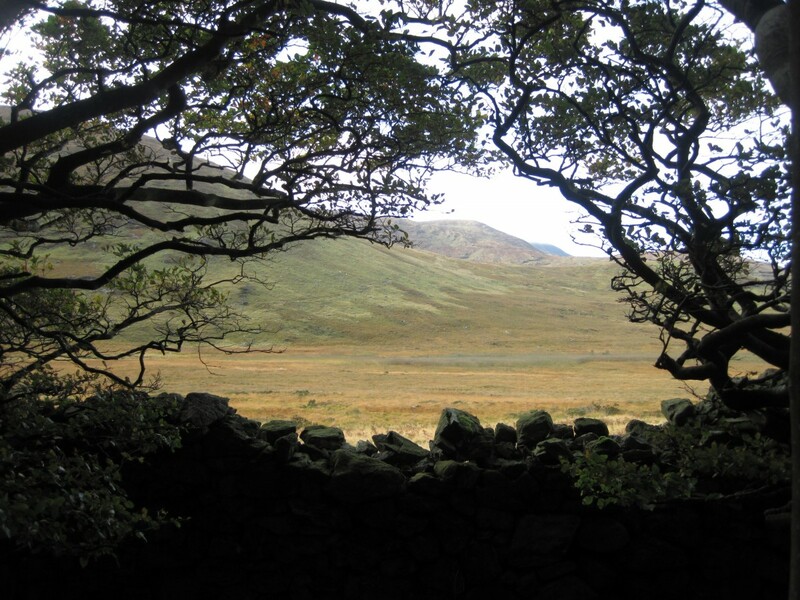 The boundary wall of Tollymore looking onto the mountains. Inspired by this elderly man’s wish to explore I found myself stepping onto the first bus for adventure the following morning. Nearly all my walking is done in the company of friends or loved ones, seldom do I trek alone, although sometimes I enjoy my own company and day-dreams . I decided to keep to the foothills and forest boundaries that way I could enjoy woodland and mountains together. The sun was rising behind me and provided an amber glow on everything in front of me. I walked through Island park (Council parkland) as dog walkers and early morning runners exchanged head nods as they went. The route I was to follow would be along the Mourne Way/Newcastle Way which borders the forests and lower peaks. Leaving Island park I crossed the bridge and made my way into Tipperary wood, a charming little wood that borders the meandering Shimna River. 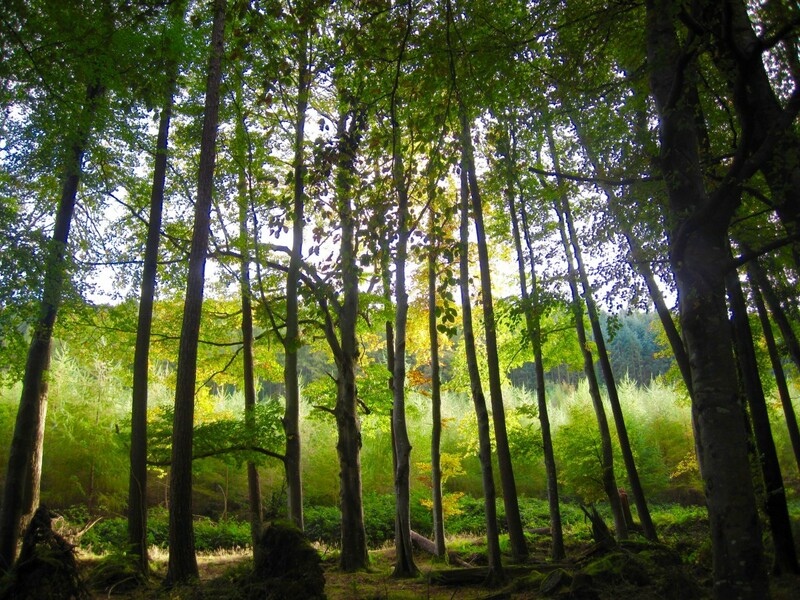 Tipperary wood almost grasps onto the river for survival as modern demand for housing sadly closes in all around it. The terrain underfoot changed from tarmac to pines needles and in some way this lifted my mood. The sound of cars and people was slowly replaced with the wonderful solitude of the deep woods. I tend not to carry my stove with me on day hikes but on this occasion I took a notion for sparking up stove for fresh hot cups of coffee and bacon sandwiches. I took advantage of a viewpoint over looking Dundrum Bay and drank my fill of tea. The trails trough Tollymore are all marked out on maps but I decided to walk off the trail and make my way through the woodland towards the boundary wall. Autumn was in full swing with leaves dropping to the forest floor all around me. Crossing the stile I found myself on open mountain side looking upwards towards Slieve Commedgh which dominated the skyline. 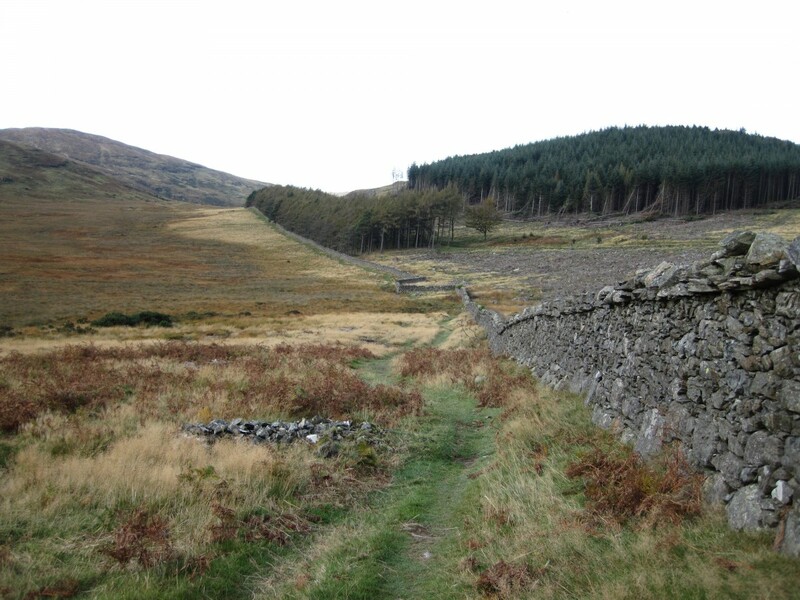 The boundary wall of Tollymore is around six feet high and is a double set with upward cope stones on top. Leaving the boundary wall trail I walked across the marsh and valley towards Luke’s mountain. The summit of Luke’s mountain is quite barren apart from a few large boulders which served well for me to avail of another brew. 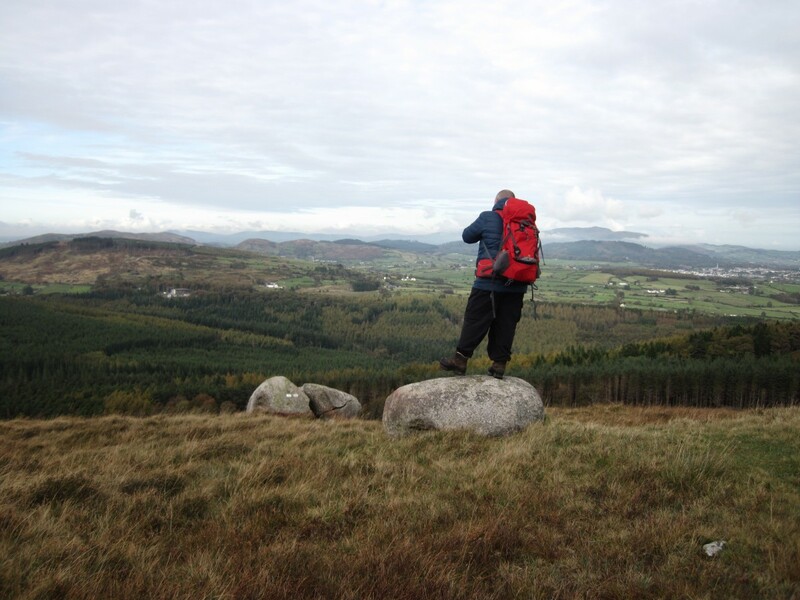 Luke’s mountain does however have amazing views towards Slieve Croob and the Castlewellan hills. Just short of the summit I discovered a Geocache -‘Tollymore Two step’, having logged the find I descended into the valley towards Spinkwee river. Spinkwee river meanders down the valley from the ‘Pot of Legawherry’ a huge basin surrounded by granite pillars. 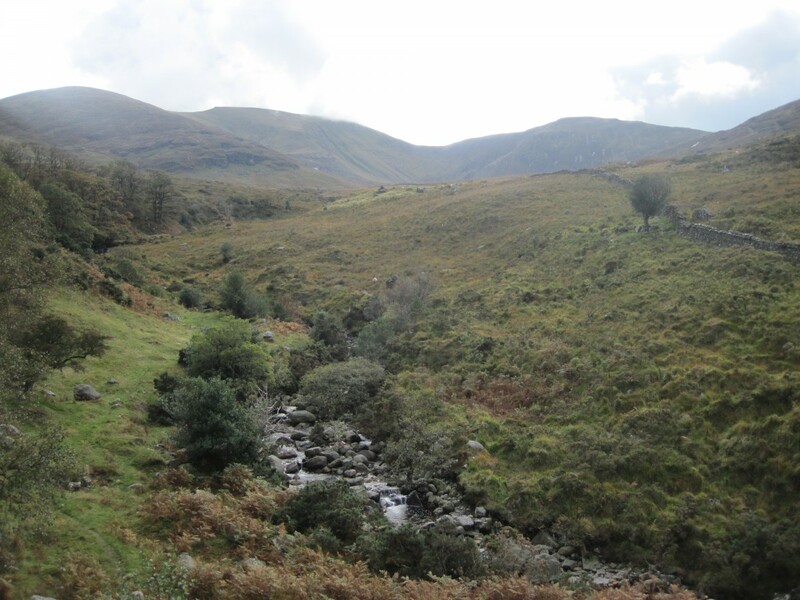 The tranquil melody of the babbling brook has lulled me to sleep many a night wild camping. Finding such a nice spot to relax I sat back against a rock and let my mind wander. Having rested for quite a while I gathered some kindling and began about startng a small fire in an old fire pit. Once the fire began to break down I placed some foil wrapped bacon on the Ember’s. There’s something very satisfying about cooking your own food on a camp fire. As I previously mentioned I usually walk with others although I must admit the occasional trek alone allows me to take the time and enjoy my surroundings. Having filled my quota on bacon butties I clambered out of the valley to once more find myself back at a lower section of the boundary wall. I decided to take a different route back through Tollymore, which would take me along Shimna River passing the parks many features such as the stepping-stones and bridges. I strolled back into Newcastle to catch the last bus home. Too me, I had made the best of my day off. I had went out hiking not only because I love it, I also took with me the dream of the old man once more venturing into the hills.